The San Diego Chargers hit the road to play the Cincinnati Bengals on Sunday at Paul Brown Stadium. The opening line for this matchup has the Bengals as 3 point favorites and the over/under was set at 45.5. The Bengals are coming off an impressive 33-13 Week 1 win against the Oakland Raiders. Andy Dalton had a nice game for Cincinnati, throwing for 269 yards with 2 touchdowns and no interceptions. 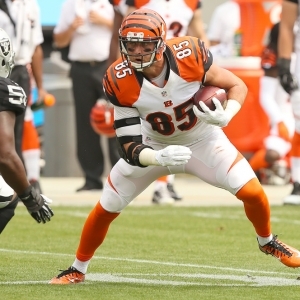 Tyler Eifert hauled in 9 catches for 104 yards and 2 touchdowns, while A.J. Green finished with 5 catches for 63 yards. Jeremy Hill led the Bengals in rushing with 63 yards on 19 carries and 2 touchdowns. Giovani Bernard also contributed 63 yards on only 8 carries. The Bengals had 22 first downs and 397 yards of total offense. They ran for a total of 127 yards on 31 carries as a team as well. They didn't do much on special teams with less than 50 yards of total returns, but they didn't really need it against Oakland. The Chargers had a come from behind win against the Detroit Lions in Week 1 at home, winning 33-28. Philip Rivers had an outstanding game, throwing for 404 yards with 2 touchdowns and 2 interceptions. He was 35 of 42 and was sacked twice. Keenan Allen had a career high 15 catches for 166 yards for San Diego, but he was unable to find the end zone. Stevie Johnson had 6 catches for 82 yards and a touchdown, while Ladarius Green had 5 receptions for 74 yards and a score. Rookie running back Melvin Gordon had only 14 carries for 51 yards in his debut, but he also grabbed 3 catches. The Chargers had 28 first downs and 483 total yards against a vulnerable Detroit defense. On special teams they only had 1 kickoff return for 24 yards. The Bengals are 5-0-1 against the spread in their last 6 games in Week 2, are 7-0 ATS in their last 7 home games vs. a team with a winning road record, and are 4-1 ATS in their last 5 games after accumulating more than 250 yards passing in their previous game. They are 15-5-1 ATS in their last 21 home games, are 8-3 ATS in their last 11 games following a straight up win of more than 14 points, and are 23-9-2 ATS in their last 34 games in September. The under is 6-0 in the Bengals last 6 games after accumulating more than 250 yards passing in their previous game, is 21-5-1 in their last 27 games after scoring more than 30 points in their previous game, and is 4-1 in their last 5 games in September. The under is also 19-6-1 in the Bengals last 26 games following a SU win of more than 14 points and is 5-2 in their last 7 games after allowing less than 90 yards rushing in their previous game. The under is 7-3 in their last 10 games overall and is 11-5-2 in their last 18 games in Week 2. The under is 4-1 in the Chargers last 5 vs. a team with a winning record, is 16-5-1 in their last 22 games after scoring more than 30 points in their previous game, and is 6-2 in their last 8 games after accumulating more than 250 yards passing in their previous game. The under is also 19-7 in the Chargers last 26 vs. the AFC, is 5-2 in their last 7 road games vs. a team with a winning home record, and is 14-6 in their last 20 games following a S.U. win. In head to head matchups, the over is 4-1-1 in the last 6 meetings in Cincinnati and is 7-3-2 in the last 12 meetings. The Chargers are 4-1 ATS in their last 5 meetings in Cincinnati and are 1-4 ATS in their last 5 meetings while the road team is 7-1 ATS in their last 8 meetings.